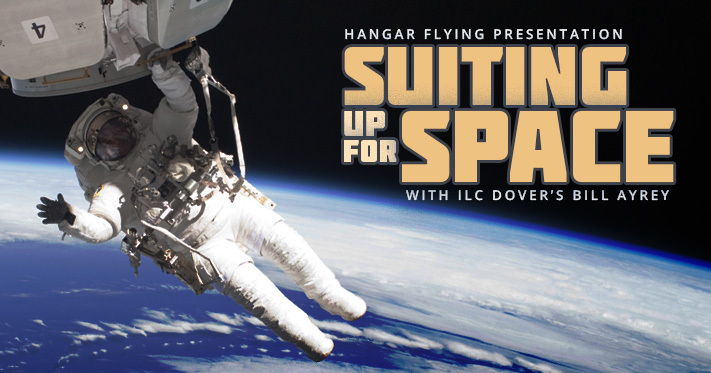 Event Date: Sunday, 31 January 2016 at 2:00 p.m.
Join us for another fascinating Hangar Flying talk with Bill Ayrey from ILC Dover on 31 January 2016, 2 p.m. Bill will talk about the history of the Apollo space program and the development of suits by ILC Dover that allowed the 12 astronauts to walk on the moon. He’ll also cover the current efforts to preserve and display Neil Armstrong’s suit at the Smithsonian as well as the challenges of preserving all of the suits in their collection. Also, learn about the current suits ILC Dover build for the Space Station as well as the latest suit, Model Z2, that’ll be used on Mars. Be ready for a fascinating talk as Bill is a dynamic speaker who can reach audiences of all ages. ILC Space suits now have over 1,700 hours protecting astronauts from the hazards of the space environment, including problem-free Lunar spacewalks during the Apollo missions. Bill will bring various space suit parts including gloves that you can try on! Bill has been with ILC for over 30 years and along with his primary job as Test & Calibration Manager, he also acts as their Company Historian. It’s well worth your Sunday afternoon, if you like space, aviation or just interesting local history. So come on out and learn something while having fun. This Hangar Flying event is free!